This hatch is ABS Certified for use on ABS classed vessels or facilities by the American Bureau of shipping on ABS Certificate Number: 16-HS1547190-PDA. The ultimate in strength and simplicity, Baier’s original patented strongback system has only two moving parts to secure the hatch cover to the deck. It is superior to other more complicated hatch closure systems in that it is simpler, stronger, more reliably watertight, infinitely adjustable from topside, and more easily serviced (parts are readily available and replaced in the field). Importantly, the recessed hex centerbolt and grab handles offer no snags for nets, lines or hardware. 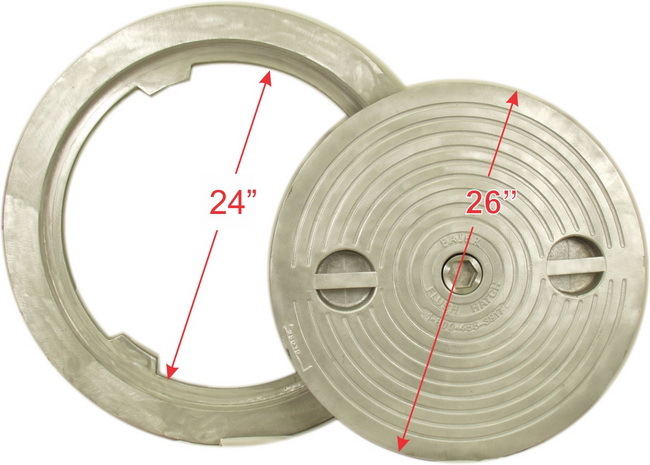 The Classic Model BFH hatch product line is available in both cast aluminum and cast steel. Baier is the only company to offer steel hatch covers which is stronger, more durable, and more impact resistant when compared to iron hatches, especially in cold climates. All of our Steel Cover assemblies and deck rings are hot dip galvanized for superior corrosion resistance. The deck ring is available in galvanized mild steel (for welding into steel decks), or cast aluminum (for welding into aluminum decks or bolting to fiberglass or wood decks). Cast stainless steel hatches and fabricated stainless deck rings are available by special order. It has long been standard equipment on fish boats, tugs, barges, workboats, and other marine vessels, as well as many U.S. Navy and U.S. and Canadian Coast Guard vessels.